Yes, a percentage of your gross sales as specified in your franchise agreement goes into a fund that is used to promote Bruegger's both nationally and locally. You are also required to spend 2% of your gross sales on local advertising. We are actively seeking franchisees who have the drive to succeed in a nationally-recognized concept that places strong emphasis on the success of its franchisees. 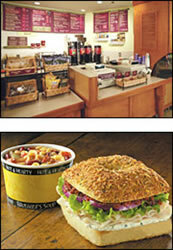 Bruegger's has offered franchising opportunities since 1993. 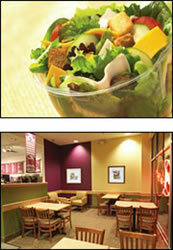 We are well positioned to take advantage of the national trend toward quick casual restaurants. Our bakery-cafés offer upscale customers a variety of freshly baked bagels and proprietary cream cheeses - and a whole lot more, like soups, made-to-order salads, custom-blended coffees, deli-style sandwiches, and scrumptious desserts. Our products are made with all-natural ingredients, and we take pride in providing excellent customer service. We offer a warm, inviting atmosphere for our customers in our newly designed bakery-cafés. Bruegger's franchisees are hard working, results-oriented people who appreciate the benefits of a proven system. They care about customers and enjoy providing healthy, nutritious food at a good value. Our most successful franchisees are involved in managing the day-to-day operations of their bakery-cafés. We know how important training is to the success of our franchisees, and we take it very seriously. Bruegger's dedicated trainers will be sure that you and your employees are familiar with the proven and effective operating concepts before you open your first two bakeries. You and your Operator will train in one of our Training Bakeries for up to 8 weeks prior to the opening of your first bakery-café. In addition, one of our experienced Franchise Operations Consultants will be assigned to assist you with the first two bakeries you open and provide ongoing site visits, training and operational assistance. Bruegger's is seeking franchisees who are adequately capitalized. We seek candidates with a minimum liquidity available of $300,000 and a net worth of $600,000. We estimate the start-up costs for a Bruegger's bakery-café will range from $330,400 to $559,400. Click on Request Information for FREE info on how to open a Brueggers Bakery and Cafe franchise today! Please Note: This Bruegger's Bakery and Cafe franchise opportunity and other franchise business opportunities, businesses and franchises for sale on this web site are not to be considered as an "offering", "franchise offering", suggestion or recommendation by Franchise Leader™. This advertisement depends entirely on the truthfulness of the information provided by our advertisers which includes, but is not limited to, franchisers, franchise brokers, franchise consultants and business brokers. Franchise Leader™ recommends that you consult a lawyer, financial consultant, accountant or professional advisor before buying a franchise or business opportunity or any type of business. By using this form or any part of our website, you have agreed to all terms and conditions of Franchise Leader™. Please review our Terms & Conditions for more information.